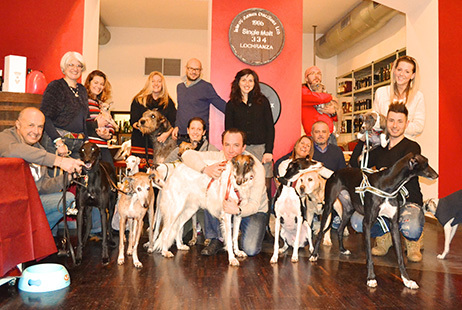 We are a nonprofit association that promotes a new culture of life with six legs in the city, helping to make Milan a "dogs welcome" model metropolis! Conquer the spaces of the city, making them accessible, transforming them into opportunities for those who share their lives with a dog. Mylandog organizes meetings, days of aggregation, aperitifs, theme dinners, trips, opportunities to meet, exchange, training, entertainment, information. Thanks to the consolidated collaboration with educators, trainers, communication experts, dog welfare, care and feeding of our furry friends, each event offers the opportunity to learn more about our dogs, and have to deal with them relationship increasingly strong, aware, responsible and rewarding. First of all, having fun together. Mylandog is an aggregation point for all the organizations that the area devoted to the care, hospitality, protection and well being of the dog. Together it is stronger and more representative. For this, in its initiatives involving Mylandog shelters, associations for the defense of the rights of the dog and animals, pet therapy groups, nurseries, association and other organizations that focus on the relationship between dog and man. To raise funds, but not only, especially to contribute to the formation of a more conscious culture of living with animals. Mylandog directly promotes awareness initiatives to spread a more aware and participatory culture of life with the dog in the city, so that dogs and their human companions feel more than welcome, welcomed, as part of the only urban community. Mylandog adheres and also promotes campaigns to protect the rights of dogs, against exploitation, against abandonment and in favor of a more responsible way of life with the dog. Each activity and initiative of Mylandog attending a fundraiser, which helps support the association actually volunteer, involved in providing protection and care and better future to the many dogs less fortunate. Mylandog: A new virtual meeting place for citizens and physical animal lovers. Join the community that has one common denominator: to share the passion for four-legged friends. A website that offers a calendar of events, news, links to all the social, where you can post videos and pictures of our friends. Together, we can become the reference point for those living with a dog in our beautiful city. • Ask about us using our contact form.